From the Baldwin County Courthouse, go west on Hancock St. which becomes Highway 49 and follow Highway 49 south for 10.3 miles from the Courthouse. Turn left on a small dirt driveway which leads approximately 100 feet to the cemetery. The cemetery is visible from Hwy 49. 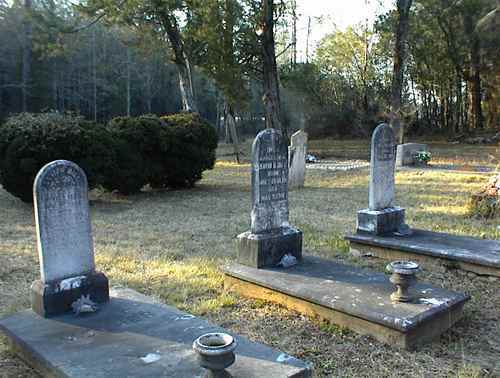 Graves numbered 100 and higher have been added since the original survey. "Pa, Daddy, we love you but God loved you best"
Five unmarked slabs and 1 brick vault. Inscription carved in old cement slab. Devoted husband, father & son. Shares headstone with Lawrence Ford Hill Grave 22. Georgia, Pvt. 404 Res. Labor Bn. but gravestone does not say. "Jr. Boy" All info from obituary.